North Korea will not give up its nuclear weapons. Successful U.S. diplomacy hinges on that realization. It should surprise no one that the United States and North Korea have run into hiccups in their latest bout of diplomatic rapprochement. Since signing a vague statement at their Singapore summit meeting on June 12, both US President Donald Trump and North Korean leader Kim Jong-un have left the business of implementation to their respective deputies. So far, talks to see through the vision expressed in the fuzzy Singapore declaration have not gone well. 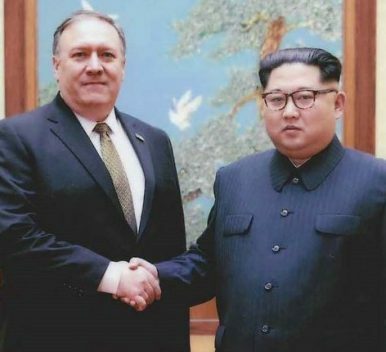 US Secretary of State Mike Pompeo’s recent visit to Pyongyang – his third overall and second in his current role – showed why. In Pyongyang, Pompeo committed the cardinal sin, in North Korea’s view: he insisted on Kim Jong-un’s unilateral disarmament. After his departure, the North Korean Foreign Ministry issued a statement that chided the US state secretary’s “gangster-like” insistence on unilateral disarmament. It asserted that not only was North Korea not interested in this condition, but it ran counter to the spirit of the Singapore declaration. The North Koreans have a point. However else they might choose to deceive the US in talks, their negotiating position has been crystal clear. Even as early as May 16, Kim Kye Gwan, North Korea’s first vice-minister of foreign affairs, noted that “if the US is trying to drive us into a corner to force our unilateral nuclear abandonment, we will no longer be interested in such dialogue and cannot but reconsider our proceeding to the DPRK-US summit”. Accordingly, the statement signed in Singapore, contrary to what Pompeo or Trump might have insisted upon, did not make reference to the unilateral disarmament of North Korea. Instead, it committed North Korea to work “toward the complete denuclearisation of the Korean peninsula”. That statement is plenty ambiguous and that’s a feature for Pyongyang – one that it hoped would allow it to enter broader talks with the US to improve the bilateral relationship. For North Korea, the “complete denuclearisation” of the Korean peninsula is not a unilateral process. In the broadest conception of the phrase, Pyongyang may take it to mean global nuclear disarmament. More narrowly conceived, complete denuclearisation of the peninsula would also necessitate an end to the US’ nuclear umbrella over South Korea. Since Pompeo’s departure, a North Korean negotiating team has stood up their US counterparts at the demilitarised zone. The parties were to discuss the return of the remains of US soldiers killed during the Korean war, fulfilling a promise Kim had made to Trump during their parley. But the US team was left waiting without any word from Pyongyang. The US, in the meantime, has criticised North Korea for evading UN Security Council sanctions. The bumps in the road are jarring the implementation of the Singapore summit one by one, as many of us had predicted. The question now is whether the US administration will choose to cast aside old shibboleths related to North Korea’s unilateral disarmament and deal realistically with Pyongyang as it is today. Its revised goals could include simply seeking to improve the relationship and, if all goes well, securing some kind of stabilising arms control agreement. For now, all signs point to the opposite. Pompeo appears committed to keeping his president happy and putting up the appearance that positive talks are continuing. In Belgium, standing alongside Trump at the Nato summit, Pompeo said that North Korea still intends to denuclearise – despite his experience in Pyongyang days earlier. Sooner or later, the reality of North Korea’s nuclear status will hit the US. When it does, it will be in the form of either a diplomatic brick wall, putting an end to the Singapore process and threatening to plunge Washington and Pyongyang back into the dangerous brinkmanship of 2017, or a sobering moment of clarity. For South Korean President Moon Jae-in, meanwhile, much rests on the success of the US-North Korea diplomatic process. That’s why Moon, in Singapore last week, emphasised that the North was looking to build trust with Washington. That much is true. For Pyongyang, the Singapore declaration, above all, was a statement of intent to improve the overall cadence of its bilateral relationship with the US. From Kim Jong-un’s perspective, until that happens, there’s little to be said on nuclear arms control; forget denuclearisation. This article first appeared in the South China Morning Post. It is republished here with kind permission. Kim Jong Un Grabs the Headlines At Home, But What Did Trump Get From the Historic Summit? The summit between Donald Trump and Kim Jong Un was historic, but far from the "epochal" event claimed by both leaders.